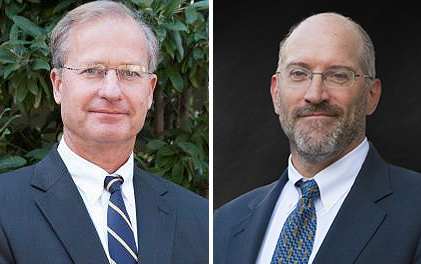 Donald van der Vaart and John Evans, formerly the top two officials at the NC Department of Environmental Quality under Gov. Pat McCrory, have been absent from their offices, and their job status is uncertain, sources have told Policy Watch. Van der Vaart, who earns $98,000 a year, and Evans, whose annual salary is nearly $93,000, work as section chiefs in the Division of Air Quality, in technical services and ambient monitoring, respectively. They are still listed in the online employee directory. However, their individual email replies state that each is out of the office, with no information regarding a return date. They did not respond to messages left on their voicemail seeking comment. A DEQ spokesperson could not confirm, deny nor comment on their job status, citing state personnel laws. The governor’s communications office did not return calls seeking comment. Policy Watch called the DEQ employees referred to by van der Vaart and Evans in their emails. Neither could say when the two would return to the office. However, Van der Vaart and Evans invited scrutiny from agency leadership in late September after they published a seven-page opinion piece in a national environmental law journal calling for the elimination of a key air quality rule. That rule, known as PSD, or Prevention of Significant Deterioration, was enacted by Congress 45 years ago. The intention of PSD regulations is to prevent major polluters from eluding stricter emissions rules by moving into areas where the air is relatively clean. The industries could then sully the air in their new locations. At the time, DEQ issued a statement saying that the opinion expressed in the journal did not reflect that of the agency, which supports the rule. Further adding to the controversy, both men have enforcement duties at DEQ. The content of the article is not surprising, given van der Vaart’s and Evans’s anti-regulatory reputations, but their hubris is striking. The article did contain a disclosure stating that the opinions were solely those of the authors, but it was in very small type and could have been easily overlooked. And at the top of the page, in large type, their names were accompanied by their job titles at DEQ. Policy Watch questioned at the time if either van der Vaart or Evans, who shared the byline, wrote the article using state computers or while they were on the clock in their state positions. 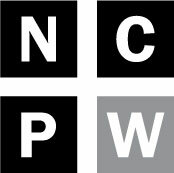 Policy Watch has filed a public records request seeking any correspondence about the journal article on both men’s state email accounts. From 1994-2013, while working for DEQ, Van der Vaart has teamed up with Evans 24 times to write opinion pieces for legal journals, according to Van der Vaart’s curriculm vitae submitted in advance of 2013 congressional testimony. Many of the articles, particularly of late, advocated for looser air quality regulations. For example, in 2013, while working for Secretary John Skvarla, a kindred spirit in terms of regulations, van der Vaart and Evans authored “The Clean Air Act: An Environmental Veneer for Protectionism” in the Environmental Law Reporter. As DEQ secretary, van der Vaart butted up against the Obama administration’s EPA about the PSD rules. 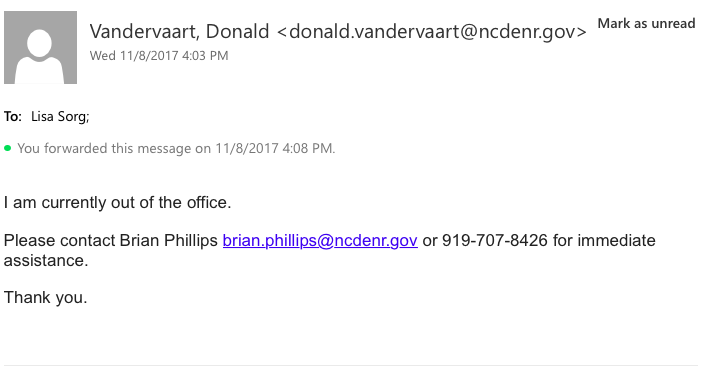 Van der Vaart was in charge last September when the EPA disapproved of North Carolina’s implementation plan for those rules, as they related to emitters of fine particulate matter. That pollution, known as PM 2.5, is important because it burrows into the lungs and can cause or worsen respiratory illnesses. DEQ challenged the EPA’s disapproval. But a federal court in Washington, D.C. dismissed the case. The result: DEQ had to change its plan. But under EPA administrator Scott Pruitt, van der Vaart has found a friendlier atmosphere for his views. In fact, Van der Vaart was in the office as recently as a week ago, when he confirmed through a DEQ spokesperson that he had been named to the EPA’s Science Advisory Board by administrator Scott Pruitt. Van der Vaart’s appointment to that board was part of Pruitt’s overall house-cleaning of independent scientists from the SAB. In their place, Pruitt appointed representatives of polluting industries, environmental heads from conservative states and other anti-regulatory figureheads. Van der Vaart was appointed DEQ Secretary by Gov. McCrory in 2015, to replace Skvarla. A year later, van der Vaart anointed Evans as his chief deputy. When Roy Cooper became governor, both men could have been fired because they were political appointees. But van der Vaart demoted himself and Evans to mid-management positions in order to shield themselves from losing their jobs.